A rising force in remedial building and upgrades is Buildcore Constructions. Builder Mark Granger is putting his background in high-end residential construction, internal fitouts and renovations into fixing problems for multilevel apartment buildings. With changes to regulations, many older apartment complexes no longer meet building codes or are deemed unsafe. Balustrade compliance, leaky roof membrane replacement and façade upgrades are just some of the remedial works being carried out. It’s a growth industry for builders: one in which Buildcore has positioned itself on the top rung of remedial construction firms. Providing expert project management, Buildcore has built a reputation as a top-notch player that value adds for the client, is in constant communication with all stakeholders, and ensures minimal disruption to the site. Although it has been operating for over eight years, Buildcore just launched its remedial strata work two years ago. Since then it has gone from strength to strength. “I wanted the business to grow and we’ve done that by focusing on strata work,” Mark said. 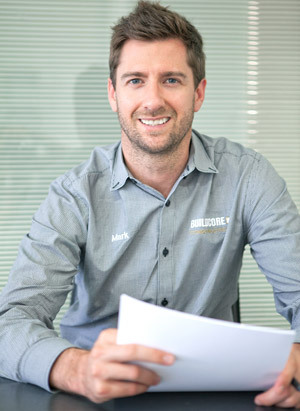 Buildcore uses a team of subcontractors under Mark’s leadership. Full project management is an area Mark agrees has been lacking when it comes to strata building works. Governing bodies for strata buildings – like body corporates, owner committees, strata managers and building managers – often don’t have the time or the construction knowledge to project manage effectively. Mark not only has the experience as a hands-on builder but also prides himself on his high level of communication with all parties on an ongoing basis. Management and all building occupants alike are kept up-to-date. Buildcore provides a site plan that includes a mock-up of where construction fencing, on-site toilets and emergency equipment will be located. Information such as where and when specific work will be carried out, access limitations and progress reports are all covered. What Mark likes to do is post notices in the building foyer for everybody to see. He often includes photographs, especially for work carried out in areas that people can’t see, such as roofs. Communication is just as important when delivering job quotes. This process was highly praised by owners of a Caringbah residential complex who recently had all balcony balustrades replaced. The balustrades had been condemned as unsafe and failed to meet regulatory changes in height standards. Mark provided a comprehensive quote, including options using different materials and balustrade designs to provide acceptable safety to residents. Another project was waterproofing leaking roofs on a strata group comprising of four buildings. The owners couldn’t be happier with the completed work and Buildcore is spreading its name and garnering attention for strata projects around the district.